In stock -This product will ship today if ordered within the next 14 hours and 21 minutes. 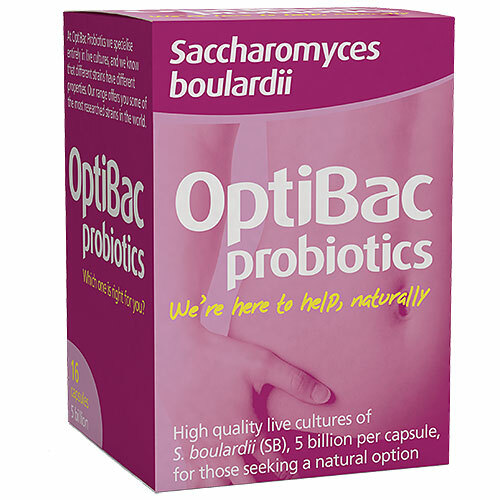 OptiBac Probiotics Saccharomyces Boulardii Saccharomyces Boulardii contains 5 billion microorganisms of pure Saccharomyces boulardii, a natural and safe probiotic yeast to help support normal bowel health. Saccharomyces boulardii has been internationally acclaimed as the number one probiotic to help provide fast acting bowel calm, comfort and control in one dose. Saccharomyces Boulardii Saccharomyces boulardii is a natural probiotic food supplement offering support for normal bowel health and comfort. This unique probiotic works by binding to, and flushing out, pathogenic bacteria and yeasts in the body. All natural probiotics - no added sugars, preservatives or sweeteners. 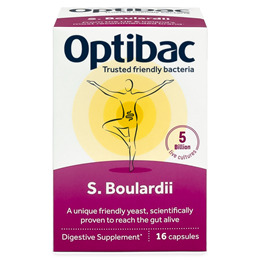 OptiBac Probiotics were the first company in the UK to offer Saccharomyces boulardii as a supplement. Live cultures: Saccharomyces boulardii; vegetarian capsule: hydroxypropyl methylcellulose. Take 1-4 capsules daily depending on severity of symptoms and up to 6 capsules daily, or as professionally directed. Food supplements should not be used as a substitute for a healthy diet and lifestyle. Those with serious medical conditions should consult a doctor before use. Store in a cool, dry place. No refrigeration necessary. li>Keep out of reach and sight of children. This product does not interfere with medicines or supplements for diarrhoea. Below are reviews of OptiBac Probiotics Saccharomyces Boulardii - 16 Capsules by bodykind customers. If you have tried this product we'd love to hear what you think so please leave a review. Excellent, life-changing product, and brilliant company that is helpful and great to order from, and best price. I take it daily, and would not be without. Wonderful product l have been taking this product for 11 days now and am feeling much better and have lost some of the bloated feeling and lost some weight through that. I have already recommended it to 3 people. Excellent - definitely improved my gut health. EXCELLENT PRODUCT. GOOD VALUE FOR MONEY. WILL BUY AGAIN IT HAS HELPED A LOT WITH MY ULCERATIVE COLITIS. Big improvement for IBS-D. At start I needed to learn how many to take to avoid too much wind. However, I would like more time to be totally convinced. An amazing probiotic product. I used it to make a starter for a Turkish drink called 'boza' which is very good for Candida infection. The fermentation was very successful. It arrived very quickly and was better value than amazon. This product has really helped to keep my diverticulitis and IBS under control, wonderful to be pain free. This brand and their particular strain is recommended for people who have a blastocystis infection. They've been very good for my daughter who has it. She no longer complains of a tummy ache all the time. Used short term for stomach upset and to reduce inflammation in colon. I take this product everyday for my IBS. I believe as it is natural, it is far better for you than Imodium. What's more, it actually seems to be even more effective than anti-diarrhoeal medicines. Highly recommend this product for anyone suffering from irregular bowels, diarrhoea, IBS or IBD. Question about OptiBac Probiotics Saccharomyces Boulardii - 16 Capsules BetterYou Magnesium Oil Joint Spray - 100ml - is this for internal or external use ? Spray 5-10 sprays directly to joint or muscle area. Apply to wet or dry skin. Concentrate on muscle areas to aid stretching and warm-up and to avoid post exercise cramping. Can be sprayed anywhere on the body, avoiding eyes and mucus membrane. There is no upper limit but start any new health regime gradually. 10 sprays deliver 30% of your RDA. Each bottle contains up to 800 individual sprays (6-8 weeks).